Per my earlier post on Mien Trung, I purchased a log of what I thought was cha lua. Turns out it wasn't. 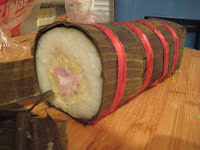 It's a log of sticky rice filled with mashed mung beans and salted pork. Very interesting. When I had this at home, we'd slice it up and toast it in a little bit of oil. Then, it'd be served with fish sauce. Good stuff. I've been too lazy to fry it, so I'm nuking slices of it. Still good. Any chance of you teaching a few local hounds about vietnamese food with a Vietnamese Chowdown? We talked of what we should do for our next outing and this post made me think of all that I need to know about Vietnamese cookery. If you can't - what places should we go and what should we have for novices? While I appreciate the compliment to my knowledge of Vietnamese food, I don't think I can tell y'all anything you don't already know. ;) I'm an enthusiast of Vietnamese food and I'd like to think I have a discerning palate for it, but when it comes to the finer academic points of the cuisine, I'm useless. However, I would love to join you guys on the next Chowdown and I do have some thoughts on dishes we should try. How about 7 courses of beef (bo bay mon)? There's also a catfish dish that I love... whole roasted catfish served with tons of greens and rice paper for rolling. Unfortunately, I don't know the best places in San Diego for sampling these dishes. There's BBM everywhere, but I have yet to have a good version of it. Phuong Trang does the fish, but it always looks kind of burnt. I'll bet someone from CH would know. How about Kirk?